If you're short on space or simply want to buy the most efficient desk there is, we recommend a corner desk, which will fit neatly into the corner of any room. Corner desks are popular options for craft rooms, student homework stations, and for living rooms where homeowners want a workspace, but don't necessarily want a desk to be a prominent feature of their room design. In this curated list of the best corner desks for sale online, we round up high-quality corner desks for small spaces. We chose stable, well-made desks in a variety of styles, so you can find a desk that will fit well into your design style, and mesh with your personal decor. In this section we offer a side-by-side quick comparison of the best corner desks for sale online. Detailed reviews, buying advice, and information about our selection and review process can be found immediately following this quick-view list. These desks are listed in order of price, with the most expensive corner desks at the top of the list, and the most affordable corner desk options at the bottom of the list. Finley Home offers a budget friendly and stunning cube-shelf and modern desk in their Hudson furniture line which easily makes our list of the best corner desks. If you have a small home office and want a bright, contemporary desk which offers attractive storage on a relatively small footprint, this is an excellent unit to consider. The cube bookshelf extends just under 5 feet along your wall, and you can mount the desk in the middle of the bookcase, up against the wall, or toward the room to create a cozy workspace which faces out. The desk extends just under 4 feet from the edge of the bookshelf, and the open design of the unit's bright, durable melamine surface will complement any decor. This corner desk unit is hollow-core with a unique honeycomb construction beneath MDF and Melamine. It's surprisingly sturdy for how light it is, and this attractive desk offers the perfect union of beauty, functionality, and a small footprint for a small, contemporary home office. We love it, and think it's a great value at under $400! The classic look and efficient footprint of this small L-shaped corner desk from Sauder will make it a favorite for many homeowners looking to fournish their home office or craft room. 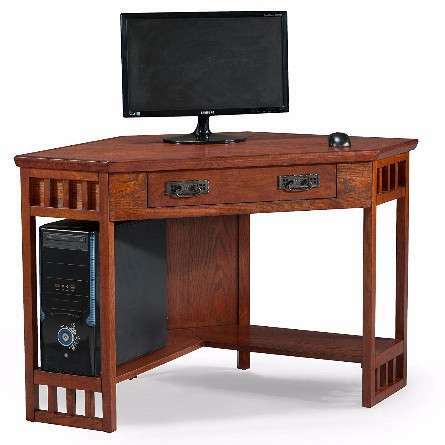 This corner desk's cherry-finish work surface is made of heat, stain, and scratch resistant melamine, and the desk features a keyboard/mouse tray which slides out from under the desk (and which can be positioned on either side of the desk, or for a corner-facing computer setup). If you hate the look of a computer tower and wires on the floor of your office, you can neatly tuck it into the CPU storage compartment, and there are attractive doors for storage included on this 66" x 66" corner workstation. The lowest drawer can accommodate European sized hangin files. If you're looking to fournish your office with matching furniture, the Harbor View set from Sauder is an excellent option. There's a matching storage hutch, a lateral file cabinet, a bookshelf with doors (and one without doors), as well as a cottage-stype storage cabinet, all in the antiqued white finish shown here. The set also comes in an antiqued paint finish (with a dark base). This is an attractive, well-made L-shaped corner desk from an American manufacturer known for producing durable office furniture, and we think this is an excellent value for one of the larger corner desks on our list. Available in white (pictured), grey, dark taupe, and capuccino, this trim reversible corner computer desk offers the perfect combination of storage with an modern, open design. Two shelves and three drawers are available in the side work surface. Thick panel construction, clean lines, and slick track metal legs provide a modern feel to this desk, which will occupy an efficient 48 inch x 48 inch footprint for a small home office or apartment where space is at a premium and design is valued. We like this little desk from Monarch a lot. If you need a small desk for a modern workspace, it's a great choice. If you like the look of the Hudson corner desk and shelving unit, but prefer a different color (in addition to the pictured White it comes in Brown or Capuccino) or a less expensive model, this similar desk from Monarch Specialties might be just what you're looking for. It usually runs about $100 cheaper than the Hudson. It's a smaller desk, and doesn't feel quite as sturdy or look quite as impressive, but it's an excellent choice for a child's bedroom or for an apartment without a designated office space. Hollow core construction, and easy to assemble, this compact, modern desk is very attractive and functional as a sewing table or craft table, or if you work on a laptop and don't require a large computer screen. At under $250, it's a great value and a purchase you won't regret. An easy choice as the best corner desk in this category, our Editor's Pick is the Leick Corner Desk. Glistening highlights accent the hardwood grain of this gorgeous desk which helps it separate itself from other incexpensive corner desks in this category. Leick Furniture stands out in modern furniture because they have remained an affordable option for stylish homeowners who prefer a custom, fine-furniture look without breaking the bank. Their furniture is produced with solid, hand-finished hardwoods, not press-board or particle-board, which makes the Leick desk unique (and an amazing value at right around $200). Hardwood and birch veneers create a beautiful desk that is built to last, which comes with convenient shelves for tidy computer tower storage, a 1-inch solid top, and a flip-down keyboard drawer on ball bearing full-extension glides makes for an efficient use of space. We love the Mission style version of this desk, but it also comes in a burnished oak finish, black finish, and dark oak with iron for a more contemporary style. You will not regret buying this desk - it's a great size, well made, and looks beautiful in person. It also comes with a matching printer stand to complete the set. If you are looking for a terrific desk pacakage for a child or teenager's room, the Classic Corner Desk from Juvenile is a fantastic option. It comes in a beautiful painted finish with a matching (reversible) hutch and wooden desk chair. The hutch offers several cubbies for school supplies, art supplies, craft supplies, or toys, and also offers cable management holes to help keep computer wires or laptop charging cords tidy and out of sight. The classic design, solid construction, and affordable price point (especially considering the fact that this desk comes with a chair and storage hutch) make it a terrific value and a great choice for a student or child's bedroom. New on the office furniture scene (but making a great first impression), is the brand TOPSKY, which has been making a name for itself by creating sturdy, affordable desks like this L-shaped corner desk model which will blend easily with any decor. I love the bevel edge design which gives a light feeling to the desk in any space, and the symmetrical design is a nice feature in an L-shaped desk, allowing you to plan your home office space and layout with flexibility in mind (it can easily face the corner or the room with a predictable footprint). The legs are steel and the work-surface is a premiumu Melamine over a solid MDF board, which doesn't feel cheap. At only 63 pounds this desk is easy to carry into your home or apartment, set up, and reposition as needed, but it has a nice sturdy feel when it's in place, with minimal wobble. The steel legs feature a powder-coat finish that was excellent and consistent on the model we looked at, and the top comes in either oak (pictured), or a beautiful dark walnut. At less than $150 you can't go wrong with this sturdy little corner desk from TOPSKY, which is sure to improve the aesthetic and functionality of any office space. The contemporary vibe of MERAX's L-shaped corner desk is clean and functional. I loved the modern heavy-duty steel legs which boast adjustable feet to dial in the desk to be perfectly level, even on uneven floors, and the high-quality work-top is crafted with E1 standard wood, and a durable mealmine surface which comes in three finishes. 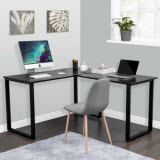 Opt for the black desk with black legs (pictured), the attractive oak-finish top with white legs, or a clean white corner desk with modern black legs (available from third-party sellers on Amazon, so it may be more expensive than the other two models). Even if you're new to assembling furniture ordered online, you should have this desk finished and in-place in under 30 minutes (which is an attractive feature that a lot of pack-and-ship office furniture can't come close to), and we found the instructions to be easy to follow. This desk is slightly larger than the TOPSKY desk listed above, but they're comparably priced, of similar quality, and similar weight and size - so if you're trying to choose one or the other you should decide based on which one you like the looks of more (functionally they're similar and I'd be splitting hairs to find major difference in terms of durability or performance). If you have the space for a small L-shaped corner desk, and are looking to spend under $150, then I think this Merax desk is a great option. This beautiful, unfinished solid-wood corner desk is a wonderful option for the DIY enthusiast looking for a weekend project. The desk is constructed of parawood (Hevea Brasiliensis), which is comparable to maple in terms of strength and durability. The desk takes paint or stain very well, and includes a solid-wood drawer which is 16.54 inches wide by 13.19 inches deep and 2.28 inches high. The butcher-block top on this desk looks great with a clear-coat of wipe on polyurethane (recommended for beginners who want to apply a high-quality finish that is almost impossible to mess up), but this desk also looks great stained or painted to match your existing decor. It was a no-brainer to include this high-quality, solid wood desk, which is a great option for someone who wants a piece of custom furniture and isn't afraid to get their hands dirty. If you're looking for a weekend project with your son or daughter, why not get them a new workspace for homework that they can make their own? This is a quality desk, and a great option for someone looking for a desk they can order online and make one-of-a-kind once it arrives. At around $100, you won't feel buyer's remorse when you purchase the Simple Living Antique Corner Desk. Traditional style in antique white, a cherry finish with matching chair, or a variety of other colors and finishes makes this the perfect corner desk for small spaces. This is a cheap corner desk, but it doesn't feel that way if ordered in the white or cherry finish. 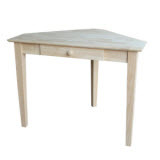 It's stable, solid, desk, which isn't made with the highest-quality materials, but we thought it would be perfect for a child or teen's room as a homework station or writing table. It's better than we expected for the money, and we feel it's a nice budget-friendly corner desk option for those looking for a low-cost solution for their home, bedroom, or craft space. Consider the following three items first and foremost when purchasing corner desk. Here are our picks for the best corner desk for the money in any given price-range. Price - We typically choose desks that are under $1,000 in price for our curated lists. Many of the desks we recommend are available for less than $300. This is intentional, because it's what most of our readers feel comfortable spending on furniture purchased online.